One of the biggest announcements at IFA this year, Europe’s consumer electronics show currently taking place in Berlin, Germany until September 5, is Intel’s launch of their refreshed 8th generation processor series. Simultaneously, laptop manufacturers like Asus, Acer, Dell, and Lenovo are releasing new hardware equipped with the new processors. Intel released two new laptop CPUs, both of which are based on the previous generation Kaby Lake processors. The Intel U-series “Whiskey Lake” runs at an ultra-low power 15 Watt. Meanwhile, the Y-series “Amber Lake” gets by with an extremely low power 5 Watt, which should significantly increase the battery life of devices equipped with this processor. In contrast to their predecessor, they come with overhauled chipsets, that natively support USB 3.1, among other features mainly relevant to hardware manufacturers. Moreover, both processors contain firmware- and OS-based updates that mitigate the Spectre and Meltdown vulnerabilities. Unfortunately, hardware-based fixes are not yet available. So let’s have a look at the new laptops equipped with these processors. The hallmark of this series is its 360° ErgoLift hinge. Not only can smoothly fold the display all the way to its back, but when folded back more than 135°, it also slightly props up the keyword to create a more comfortable angle for typing. In addition, this series has the frameless NanoEdge design, characterized by a 90% screen-to-body ratio. Both models offer smart control with face login and active stylus support. The ZenBook Flip 13 is available with the 8th generation Intel Core i7 or i5 U-series (Whiskey Lake) processor. This model features an integrated Intel UHD graphics chip and the 13.3″ screen offers a 16:9 Full HD (1920 x 1080 pixels) touchscreen. It supports up to 16GB RAM and up to 512GB SSD storage. At 16.9mm thick, it clocks in at a weight of 1.3kg. In addition to its 3D infrared front-facing camera, you can get an optional full HD world-facing camera, placed at the top left corner of the keyboard base. While operating the laptop in tent mode, this camera lets you capture the world from your perspective and tune into 3D virtual objects using mixed-reality applications. You can opt out of this camera in favor of better connectivity, specifically a USB 2.0 port. 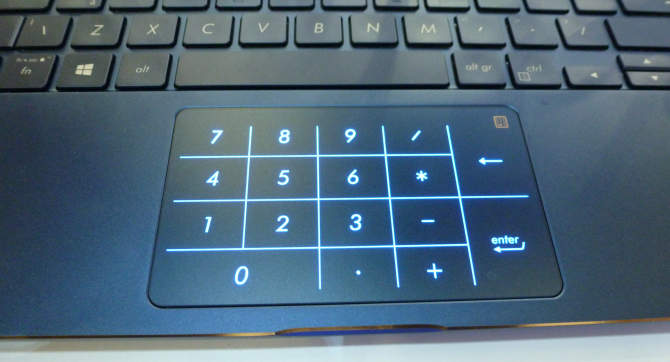 The unique feature of the ZenBook Flip 13 is the number pad integrated into the touchpad. It turns on or off via the button in the top right of the touchpad. 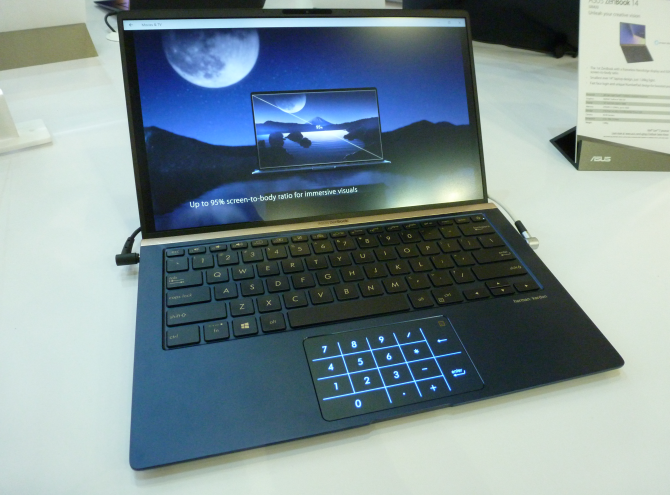 The ZenBook Flip 15 offers enough keyboard real estate to feature a standard number pad section. 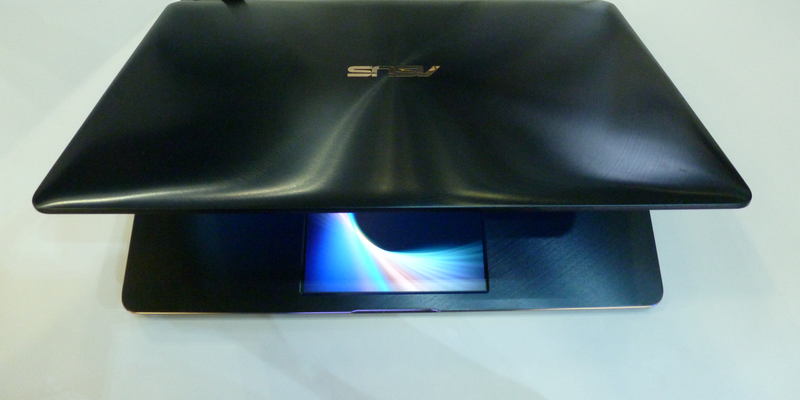 In terms of specs, this model sets itself apart from the ZenBook Flip 13 with improved graphics. It integrates an NVIDIA GeForce GTX graphics card with 2GB dedicated memory. In line with the improved graphics, you can also get it with a 4K Ultra HD (3840 x 2160 pixels) touchscreen, though you can also opt for a Full HD touchscreen. The Flip 15 weighs 1.9kg, which is fairly light, considering its 15.6″ form factor. This series features many of the same characteristics as the Flip series, including a frameless NanoEdge display with an up to 95% screen-to-body ratio, a NumberPad in the 13″ and 14″ models, as well as Intel’s new 8th generation U-series (Whiskey Lake) i7 or i5 processor and up to 16GB memory. The tight designs of the ZenBook 13 and 14, which ASUS praises as the smallest ever, contributes to the low weight of 1.09kg, for both models. 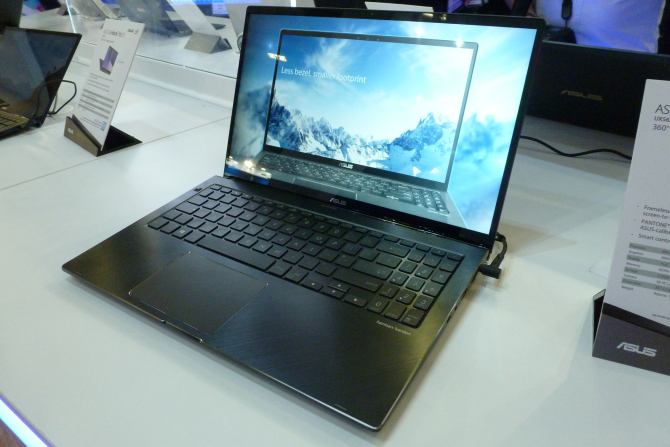 The ZenBook 15 weighs only 1.59kg. 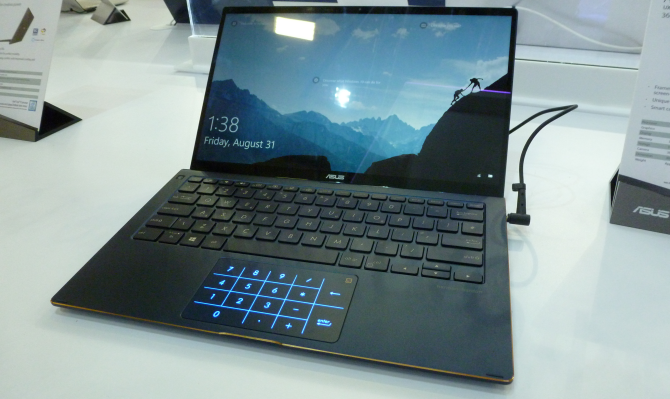 The ZenBook Pro 15‘s unique feature is its ScreenPad, an interactive high-resolution LCD touchscreen that replaces the traditional touchpad. Using the ScreenPad, you can move the cursor, launch applications, and create a miniature dual monitor setup by pulling a window from your desktop to the ScreenPad. Pair that with an 8th generation Intel Core i9 processor, an NVIDIA GeForce GTX graphics card with 4GB dedicated memory, an Ultra HD 15.6″ touchscreen, up to 16GB RAM, and up to 1TB SSD, all at 1.88kg, and you have a true power user machine. Though you can, of course, get less heavy specs. Stay tuned for more laptops featuring Intel’s new 8th generation processors and other cool features as we continue to explore the exhibition. Read the full article: Home Computing at IFA 2018: What’s New and What’s Hot?